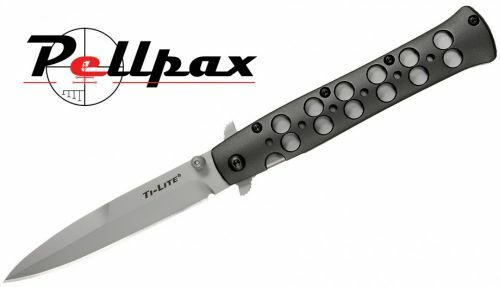 Home » Blades » Knives » Folding Knives » Cold Steel Ti-Lite Folding Knife 6"
With a CNC milled, 7075 Aluminium handle the Ti-Lite 6" offers precision, reliability and a high quality blade. The 8A Stainless steel 6" blade has excellent reach. The cutting edge has been sharpened to a razer standard to ensure your cutting needs are met. The blade has been bead blasted to give it the grey matte effect. This blade will remain strong and sturdy during any job. This is because of the Extra strong steel it's made from and the 3mm thickness helps reinforce it. The handle is made of the seriously strong 7075 Aluminium. This makes the handle able to withstand medium impacts. The Handle is resistant to organic materials and can be used for domestic or industrial use. Weighing only 4.6 oz and coming with a belt clip you can take the Ti-Lite with you everywhere you go. As well as helping you transport it the belt clip also helps you easily access your knife when you need. Cold Steel Ti-Lite Folding Knife 6"
Add this item to your basket & spend an extra £324.01 to apply for finance.